Today’s first coastal race for the Js has seen a change in fortunes and change in the overall rankings. Coastal races, with the variety of leg options can often add another element of unpredictability – as sail selection, mark roundings and team work can all make the difference. “Setting out in front with your elbows out” was how Jordy Schaefer, the mid-bow on Ranger describes the importance of getting a good start today. Unfortunately things did not play this way for Hanuman who found herself over the line before the gun. 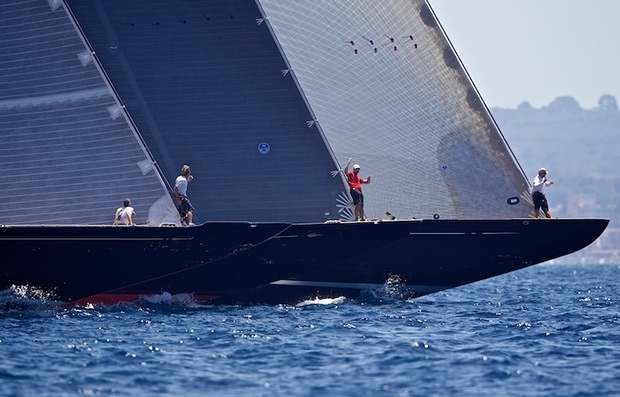 Hanuman was scored OCS as it took her longer than the allotted four minutes to return to the line and restart. However she continued to race and impressively clawed her way back up through the fleet, and in fact finished seconds behind Velsheda across the line. Ranger took second today. Schaefer reported: “a good start called by Brad Marsh, the bowman, has put us back on the money and in position to win the regatta on the last day.”Ranger impressively squeezed out Velsheda on the first windward mark, which was critical to her placing today. Results over the line saw Lionheart first, Ranger second, followed by Velsheda and Rainbow. This changes the overall standings, with Lionheart leading by one point from Ranger and two points from Hanuman. It is all to play for tomorrow for the final coastal race as there are no discards. The Regatta Village over the last few nights has been lively with tonight’s Happy Hour being sponsored by North Sails.